NFL quarterback who was selected first overall by the Houston Texans in the 2002 NFL Draft, becoming the franchise's first ever starting quarterback. He played college football at Fresno State and his #8 jersey was retired in 2007. 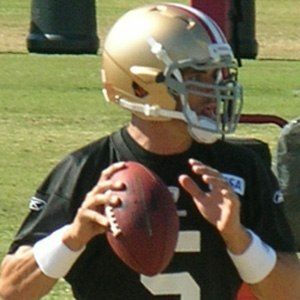 He is considered one of the biggest quarterback busts in NFL history, failing to help the Texans to a winning record in a single season, and then being released by the team after just 5 years. He is the son of Rodger and Sheryl Carr. His brother Derek also became an NFL quarterback. He played with star receiver Andre Johnson on the Houston Texans from 2003 to 2006.